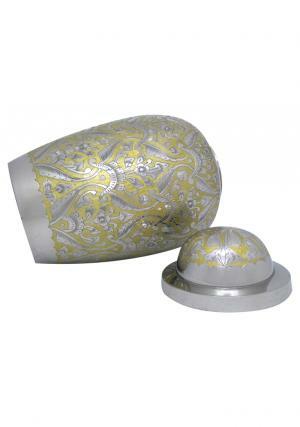 Devon Farnham Adult Memorial Ashes Urn has a beautiful full filled structure as a perfect unique piece of urn intricately hand designed from skilled professionals. 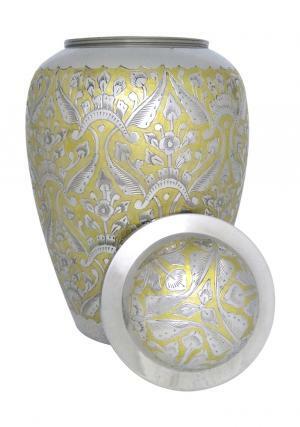 The unique gold & nickel engraved urn has the special needs that are full filled by the designers and make it a perfect presentation to store beautiful urn ashes of the loved on. 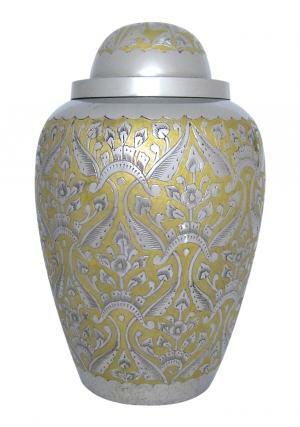 The adult urn made of brass metal with gold flower engravings and encrypted with reflective nickel finish and has same finish on the lid. The Large Adult Nickel finish urn has the threaded lid with threaded screw to the urn for a secured closure of ashes to preserve from the top of the urn. 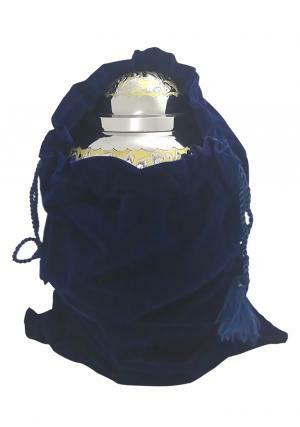 The Devon Farnham Cremation Adult urn for ashes has the dimension of 10.6 inch height, 6.9 inch in width that weighs 2.23 kg and capable of measuring 200 cubic inch ashes of human.